2018 Entrance ceremony took place on Wednesday April 4 at Nomi Music Hall (Tanto). 259 new students in the Master's program(Division of Advanced Science and Technology) and 8 new students in the Master's program (Division of Transdisciplinary Sciences) and 45 new students in the Doctoral program(Division of Advanced Science and Technology), a total of 312 new students, pledged to "work on their studies sincerely and fulfill their student duty as a member of JAIST", signed by JAIST custom, and the delegate handed their signatures to President. President Asano read an address saying that "One of the important abilities at the present time is to make every effort to the end without giving up. I would like you to keep on going until you achieve your goals. Never give up." New students, it is our best pleasure to welcome you to JAIST. Here today I believe there are many brave students with great ambition and challenging sprit. On the other hand, there may be some students who are feeling some anxiety about the new challenge. Do not worry. It is rather natural to feel anxious when we face a new challenge. I remember, when I became a college student, I was worried if I could earn college credits successfully. However, in my first semester I came to know that attending lectures diligently would prepare me sufficiently to pass any test. Soon my anxiety vanished. After I became a professor, many students consulted me about their strong anxiety about possibility of successful graduation. My experience tells me, however, this sort of anxiety motivates students to get better grades and therefore graduate on time. Attending lectures diligently is the most important key to earning credits successfully. Among many students I taught, there were some students who often failed to earn credits. They insisted that they attended most of the lectures but in fact many of them actually attended for example 10 lectures out of 14 lectures. I strongly advise you once you sign up for a course, attend its every lecture without missing any. Courses at JAIST offer two lectures per week. So missing even one lecture would lead to the risk of falling behind. In the United States and some other countries, a system called "Grade Point Average," or GPA is widely used. 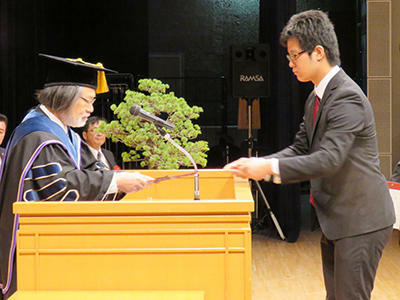 Schools in Japan use the number of earned credits to decide qualification for graduation. But in the countries like the United States, the quality of learning also matters. Colleges in Japan generally use a grade system like A, B, and C, but the GPA system uses a five-level scale of A, B, C, D and F, which are worth 4, 3, 2, 1, and 0 grade points, respectively. The number of credits for each class is multiplied by the grade points earned, and all the numbers are added up. The total number is then divided by the total number of credits to determine grade point average, GPA. No matter how many credits students earn, if their GPA dips below a certain level, they have to leave the school. This is the spirit of the GPA system. If students receive an F for a course, they earn no grade point therefore damage their GPA seriously. Consequently, students try to aim getting at least a D in each course. 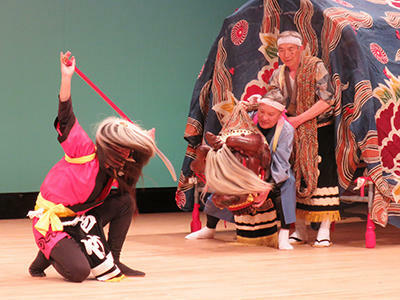 In Japanese colleges, if a student falls behind in some courses during the semester, they can simply give them up. In the GPA system, however, giving up courses means earning no grade point and therefore creating a huge negative impact. For example, suppose you have a GPA of 3.0, after taking ten courses. If you get zero grade point in one course, the only way to bring your GPA above 3.0 is to get the top grade of 4 points, from the three new courses. We used to consider introducing the GPA system here at JAIST. But not thinking the time for the introduction ripe yet, we have not been able to materialize it. That is one regret I have. The most important thing I would like to convey to you today is this: before your courses start, read the course syllabus carefully, and make every effort from the beginning to the end without giving up. Why do you need to make effort to complete your aim? Because that is the most important ability at the present time. Often, IQ tests are used to measure the level of people's ability. We tend to say that a person holding the IQ over 190 is a genius. But having a high IQ doesn't necessarily mean always being successful. In the US, there is an award called the MacArthur Fellowship, also known as "Genius Grant." Unlike the Nobel Prize, which is awarded to people who have made great achievements in the past, the MacArthur Fellowship's selection committee recognizes people who are currently engaged in meaningful and creative work. In 2013, the MacArthur Fellowship awarded a grant to Professor Angela Duckworth, a researcher at the University of Pennsylvania. When Professor Duckworth was young, she was certainly not considered a genius. In her psychology research, she found out that the most important thing for success is "grit," or the ability to keep working hard to the end. Many athletes competed very hard at the Pyeongchang Winter Olympics, but their talent blossomed only through hard practice and training. If we limit our idea of "genius" to only those who can accomplish things without effort, then I think no person we consider genius today would fit that description. As for doing something thoroughly to the end working hard, there is a rule known as the 10,000-hour rule. The rule implies that 10,000 hours of continuous effort is the secret of success. However, making effort without aim does not carry any significance. It is important to set a goal for each stage of development and make steady effort to achieve each goal one by one. When you work on something over a long period of time, it is important to keep a record. Ever since I became president of JAIST, I've recorded two things. The first one is my weight. Every morning, I weigh myself, under the same conditions, and record it. Perhaps this is why I haven't gained any weight since I became the president. The other thing I have recorded is how long it takes me to run six kilometers on the gym treadmill each weekend. It isn't because I'm trying to break a speed record -- I just hope to beat my average time. To me, the important thing is that I can cover the same running distance regardless of my age. 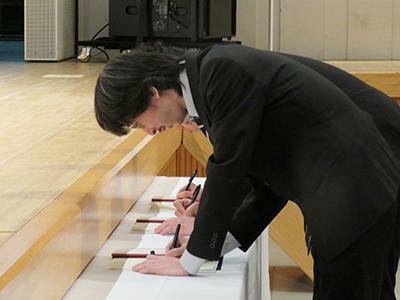 All of you will begin hard work for your study and research at JAIST. I would like you to keep on going until you achieve your goals. Never give up. The most important thing in life is to have a self-confidence. I think that working hard on something all the way to the end is the only route to obtaining self-confidence. To maintain a strong will you also need physical strength. Good physical exercise is key to improve your physical strength. Here, I have good news for you! In September of this year, we will have a wonderful gymnasium newly opened. We have not had a gymnasium, because it wasn't considered necessary for a school without physical education classes. However, thanks to Nomi City, the Diet members from this prefecture, and many others, we have received funding from the Ministry of Education, Culture, Sports, Science, and Technology to build a gymnasium. All students regardless of which major you belong to are welcome to use this gymnasium. Finally, before I finish, I would like to mention that every Thursday, if it isn't raining, Vice President Kawanishi leads a walking activity during the lunch time. The activity is about 30 minutes long, walking around the college. I also join this activity whenever I don't have a meeting. Most schools don't offer many chances to talk directly to the president. It's only once a week, so I hope you'll join us. It's a great way to make new friends, too. 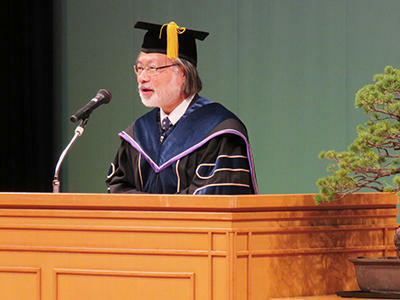 I would like to end my congratulatory speech with a strong wish that your life at JAIST will be fruitful and that you will actively change something for your bright future. Thank you very much, and good luck!